If you are looking for an easy to care for freshwater fish, the Scarlet Badis is the fish for you. The males have beautiful bright colors which almost look like living rubies. 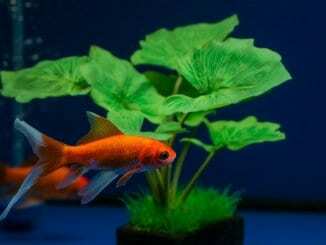 With their stunning appearance and their shy and peaceful temperament, it’s no surprise that they have grown very popular within the nano-aquarium hobby. However, they can be a bit demanding with their feeding habits and water cleaning routines, which is why we recommend them to intermediate fishkeepers. The Scarlet Badis (Dario dario) is a colorful, peaceful, fish from the Badidae family. It is also known as the Scarlet Gem Badis, and is one of the most underrated species of freshwater fish. It was previously known as Badis bengalensis or Badis bengalensis. However these two names were the result of a wrong description which appeared in a fishkeeping magazine in 1999. Even though this fish is becoming increasingly popular in the aquarium trade, there is still lots we don’t know about this fish. It remains one of the least studied Percoid fish. The circle of life for this fish is quite brutal. You might find them dead without any apparent cause. Often, at the end of their life they will likely show bright coloration as the male tries to reproduce before it dies. However with proper care and a good balanced diet, the Scarlet Badis will add bright colors to your aquarium for at least 3-4 years. Remember, they don’t like polluted waters, so keeping the aquarium clean is an absolute must. The Scarlet Badis is a peaceful and shy fish, and is easily intimidated by larger and more active fish. This is why other small peaceful fish make ideal tank mates. Because this fish is easily scared, a tank with dense vegetation is very important to give it shelter and make it feel safe. As peaceful and timid this fish is toward other fish, it is very aggressive and territorial toward fish of the same species. These fish spend most of their time swimming slowly in the middle and bottom sections of the tank, and will often stay within the plants. The Scarlet Badis is a very small fish. Males will not quite reach 1 inch in length and females are even smaller. In addition to this, males and females are different colors. This difference is known as sexual dimorphism. Adult males are a bright red or rusty orange. They have seven bands on their sides which continues on their fins too. These stripes interchange with eight silvery blue lines which also continue along the fins. The outline of the fins is generally white and the ventral fins are bluish-white in color. These colors will show even brighter during spawning. While the males look almost like jewels, females are quite dull. Females have a silvery grey coloring with clear fins. However they will also often show some coloring in the form of a few thin pale orange stripes along their sides. When buying these fish from a store, you won’t be able to tell the difference between males and females. This is because the Badis are probably still juveniles. Usually, all the youngsters are a similar color and shape. Scarlet Badis can be found in drainage systems of the Brahamaputra River in West Bengal and Assam in India. Its natural environment is restricted to this area and it only occasionally spreads to Bhutan. Here, the crystal clear shallow waters have dense vegetation with a sand and gravel substrate. Vegetation is very important for these fish as they use the different aquatic plants to establish their territories; something to keep in mind when creating their tank. 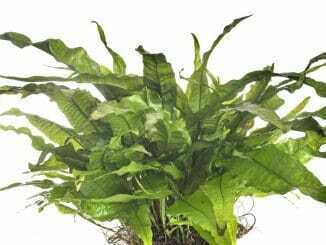 Hygrophila, Limnophila, Ottelia, Rotala and Vallisneria are some of the plants that you could find in its natural habitat. Scarlet Badis often share their space with other Badis species such as Badis blosyrus and Badis kanabo. Generally, you will find this fish swimming close to the river shores protected by thick vegetation. When setting up the tank make sure to give the fish plenty of caves and hiding spaces (you can use bogwood and plants). 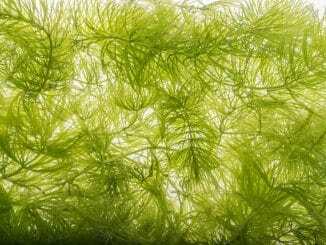 Java moss and other water plants such as water sprite are ideal for hiding spots. As mentioned before, Scarlet Badis are very territorial. Plants and caves will help them to establish territories and prevent aggressive behavior toward each other. This intense vegetation will also prevent the fish from becoming scared. You can use sand and gravel as a substrate. These fish are very sensitive to pollution so make sure you regularly change the water. Clean the aquarium at least once a week, changing 50% of the water. The ideal tank size for your Scarlet Badis is at least 10 gallons. 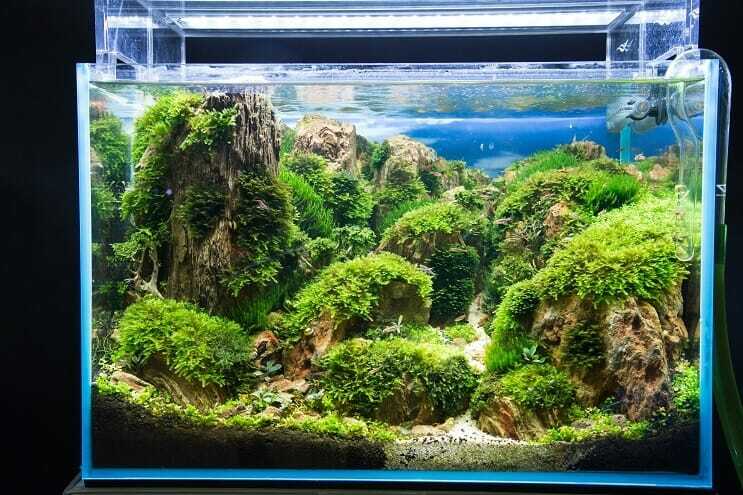 Because of their small size, they are becoming increasingly popular for nano-aquariums. Ideally these fish should be kept in a species only tank due to their extremely timid and shy nature. Their temperament will result in larger and more active fish outcompeting them for food and space. If you decide to place your Scarlet Badis into a community aquarium, you’ll need to choose their tank mates carefully. They should be put with other small peaceful fish such as gouramis. Avoid fish that are too active, because the Scarlet Badis will not want to come out to eat. 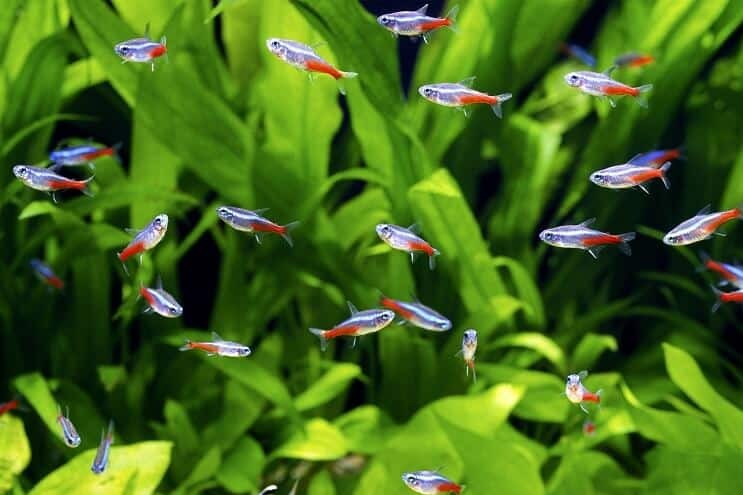 You might be successful in keeping them with a small shoal of Rasboras, as long as you make sure they are getting enough food. Large aggressive and more active fish such as bettas, goldfish and cichlids must be avoided. Other non-fish inhabitants such as shrimps and snails are not a good idea and don’t make good tank mates (they will be eaten). You have to be very careful if you want to have a group of them in your tank. Males become very aggressive towards each other if you don’t give them enough space to establish different territories. You can either have one male and several females in a small tank or multiple males in a larger aquarium. Always make sure that the tank is heavily planted. This makes it easier for the fish to establish their territories and find shelter. Scarlet Badis are fussy eaters. In the wild, they are micro predators and will eat small crustaceans, larvae, worms, insects and other small zooplankton. If you want them to thrive in your aquarium you will have to replicate its wild diet as much as possible. They refuse flake foods. They might eat small size pellet only if they are actively sinking in the water. They will mainly eat live food such as daphnia, cyclops, brine shrimp, grindal worms, banana worms, bloodworms and mosquito larvae. This species is prone to obesity and diseases. Low quality food should be avoided. A well balanced, diversified diet is the ideal way to keep them healthy and let it thrive in your aquarium. Knowing how to properly clean your tank is the secret to keeping a Scarlet Badis healthy. Poor water quality is the main causes for infectious diseases. Not much is known about diseases that they can develop in aquariums. However, some of the most common diseases of ornamental fish can be bacterial. And some diseases can be of fungal origin. These cause skin disease and are easy to identify with visible signs on their bodies. Protozoan can also be a major cause of outbreaks in tropical ornamental fish, these are parasites such as Ich, that affect skin and gills. Usually, good water quality and a diverse diet are good preventive steps. In case of an outbreak, quarantine and antibiotics are the best solutions to care for your Scarlet Badis. Be careful on the type of food you are adding to your tank. Live foods can carry infectious diseases, so make sure you are buying food from a reputable source. Breeding these fish is quite straight forward. Scarlet Badis have been bred successfully in both alkaline waters and in more acidic waters. When breeding tank vegetation is very important as they will lay their eggs on plants. As the spawning starts, the male will show off his bright colors to the females. The male will start attracting the female into its territory by shaking and quivering. If the female doesn’t respond, then the male will chase her away by attacking her. If she is ready to spawn, she will enter his territory allowing him to embrace her. This is very similar to Bettas. The male will fertilize the eggs as they get laid by the female. After about an hour, roughly 80 large eggs are laid. The female is then chased away by the male, who will defend and protect the area. This species doesn’t care for the eggs; instead the male is just generally defending its own territory. The incubation period is 2-3 days after which the fry can take up to 1 week to absorb the egg yolk sac. When the larvae hatch the offspring disappear in the tank for several days and turn into juveniles. At this stage they will start swimming and feeding on their own eating other microorganisms found between among the plants. You can feed them infusoria until they can accept a normal feeding routine such as microworms. The Scarlet Badis will bring some beautiful color to your aquarium. Although don’t be fooled, even though they are peaceful and timid fish they can be very aggressive to each another. Heavily planted tanks are vital to let them establish their own territory and make them feel safe and sheltered. They are demanding fish when feeding. As fussy eaters, they will not eat flake food and can easily become obese. Do you think you are up for the challenge? Let us know in the comments section below if you have any experience with a Scarlet Badis.